My family first heard about adopting a positive child from a family friend. Our friend mentioned a college roommate that adopted several children from Romania in the 90s...All of the kids were positive. These children were now thriving, healthy college students! At first I thought that these people were off their rocker! 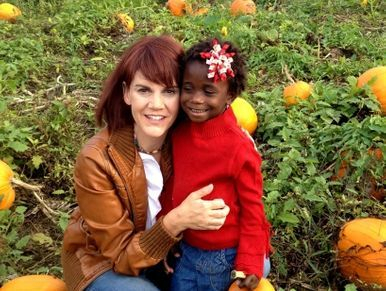 But curiosity led me to research the topic and I felt like God was calling me to adopt again, and to adopt a child living with HIV. 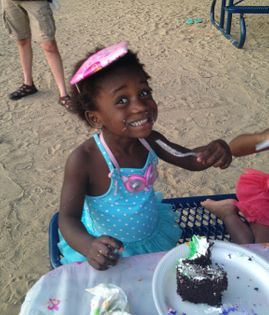 Fast forward two years...My daughter came home from West Africa in January of 2012. She is adored by her five siblings and is a joy to parent. The fact that she has an AIDS diagnosis is generally not even on my radar screen. She takes medication twice a day, swallowing 4 pills at a time like a champ. We visit the pediatric infectious disease clinic several times a year. But the characteristics that define L are resilience and joy! She is a busy per schooler that rarely gets sick. She is a generous, sweet little girl and I am blessed to be her mom.